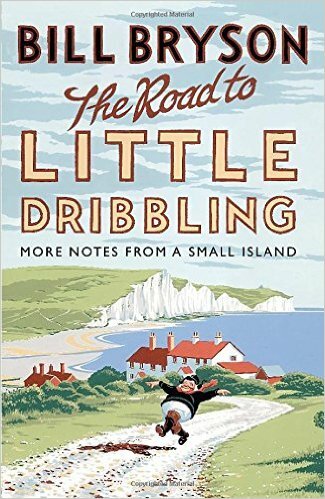 Bill Bryson has written some enjoyable books: Mother Tongue is an informed, witty introduction to the English language; Notes from a Small Island, some twenty years ago, was an amusing (if formulaic) homage to his adopted country of Britain. And he has legions of fans. I mean, this guy knows how to sell serious numbers of books. But before I slate The Road to Little Dribbling, a big thank you to my youngest sister for the book. It was a great Christmas present. I enjoyed reading it, honest. You see, once you’ve read one of Bryson’s travel books (or for that matter just one chapter) there’s a big risk you have read them all. The Road to Little Dribbling isn’t quite Notes from a Small Island Part Two, but it’s almost. Bryson goes to a part of Britain. Describes his quest for a decent cup of tea. Bewails the state of the shops. Finds Britain to be a land of mega malls, poor public transport and terrible town planners. Finds a hotel for the night. Goes to a bar. Sinks a few pints. Gets up, resolving to feel more upbeat. Finds something so delightfully quaint and British about the place. It’s enjoyable, if never taxing, stuff. Often it’s the sort of interesting reading which is good to a fill an hour, and probably a better use of an hour than surfing the net without intent. The dust jacket suggests much hilarity in store. For Sue Townsend, Bryson is ‘seriously funny’. For The Observer it’s ‘laugh-out-loud’. I did laugh, inappropriately, at a very amusing story about fearing he’d had a stroke. At other times, however, Bryson’s profanity, fondness for mocking the less fortunate and pointing out others’ stupidity felt just too easy. And forget the idea that this is book is about Britain, please. Mainly it’s England. Wales (a nation) gets a whole fifteen pages out of almost 381, and Scotland 22 pages. Let’s not forget that Scotland’s land mass is equivalent to two thirds of that of England. As with all travel writing, I checked out his comments about the places I know really well first, and was dismayed to note some inaccuracies, not least in his writing about Aberystwyth University. Such carelessness with facts kind of calls the rest into question. Yet there are little moments of real pleasure. Bryson revels in Lyme Regis, in the beauty of the Peak District, in Cumbria and Cornwall. And Bryson, an American who took British citizenship and has made his home here, has some awkward observations about the changes he’s noticed to our native islands. Britain, he suggests, has become a much brasher, more ugly country. Doing the right thing is in decline – the litter which scars out beauty spots is a case in point. And he notes, too, that one of the wealthiest nations has, post-austerity, emerged as one of the meanest. Personally, many of us are wealthier than ever. But looking after parks properly, flowerbeds on roundabouts, clean streets, that kind of thing, are all vanishing. Our towns, too, are loosing character. Shops are boarded up and places with individuality seem in retreat. Amidst the humour and the homage to a nation he clearly loves, it’s thoughts like these cut and stick with the reader. Perhaps beneath the humour there’s a little more going on.